Aranovo2 theme is using an image (post) slider for the first five posts on the frontpage. Images you can easily be set using the enabled ‘Post Thumbnail Option’ in editor. Fixed-width, Navigation on single pages, Gravatar and threaded comment support is included. Sidebar widget ready. Advertising by putting your code in a widget. About this Theme: Aranovo2 is a free WordPress Theme! Aranovo2 enables the new WordPress feature Post Thumbnail and you get a metabox in your post editor to set the Post Thumbnail. Aranovo2 is using an image slider for the latest four posts of your blog. These latest posts are inserted automatically into the slider. Images are taken and sized from the Post Thumbnail you can set, if you have attached images these are taken or extracted from the post if there is. Gravatar and threaded comment support is included. Use widgets to set your advertising script and fill the sidebar. 3 column wordpress theme, sidebar is widget ready, theme options to display a category dropdown in the navigation bar, you can exclude pages from the navigation bar, template for archives, by setting one of your categories as ‘video’ category you will see resized videos in this categories view. About this Theme: Aranovo is a free WordPress Theme! This WordPress theme is using an image slider for the latest four posts of your blog. These latest posts are inserted automatically into the slider. Images are taken from a customfield first or extracted from the post. The size of images in the slider is managed by a thumbnail resizer script (timthumb). This script can also resize and cache external images. Resizing works only for images drawn from a customfield. Arthemia theme is combining a magazine and a weblog into one; it is not too magazine-ish nor too blog-ish. Designed for WordPress. Gravatar support included along with automatic thumbnail resizer. About this Theme: Arthemix Bronze is free! This WordPress theme is using an image slider for the latest four posts of your blog. These latest posts are inserted automatically in the slider script. The size of images in the slider and on most templates is managed by a thumbnail resizer script (timthumb). Original images are taken from a customfield in the post. Gravatar and threaded comment support is included. Use widgets to set your advertising script and fill the sidebar. About this Theme: Arthemix Green is free! This WordPress theme is using an image slider for the latest four posts of your blog. These latest posts are inserted automatically in the slider script. The size of images in the slider and on most templates is managed by a thumbnail resizer script (timthumb). Original images are taken from a customfield in the post. Gravatar and threaded comment support is included. Use widgets to set your advertising script and fill the sidebar. 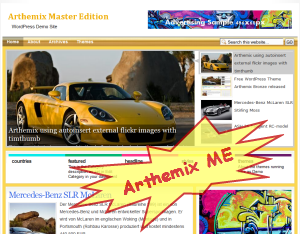 About this Theme: Arthemix Master Edition is using an image slider for the latest four posts of your blog. These latest posts are inserted automatically. The size of images in the slider and on most templates is managed by a thumbnail resizer script (timthumb). Original Images are taken from a customfield or by autoinsert the first image in the post. Gravatar and threaded comment support is included. Display settings in theme options let you set the categories to show in the category bar and exclude pages from the navigation. Use widgets to set your advertising script and fill the sidebar. This theme is using an image slider for the latest four posts of your blog. These latest posts are inserted automatically. The size of images in the slider and on most templates is managed by a thumbnail resizer script (timthumb). Original Images are taken from a customfield or by autoinsert the first image in the post. Gravatar and threaded comment support is included. Display settings in theme options let you set the categories to show in the category bar and exclude pages from the navigation. Use widgets to set your advertising script and fill the sidebar. About this Theme: Barthami Corporate is using an image slider for the latest four posts of your blog. These latest posts are inserted automatically. The size of images in the slider and on most templates is managed by a thumbnail resizer script (timthumb). Original Images are taken from a customfield or by autoinsert the first image in the post. Gravatar and threaded comment support is included. The theme options let you set the categories to show in the category bar and exclude pages from the navigation. You can choose to display a category dropdown in the navigation bar. You can set the number of posts to display in the two column area. Use widgets to set your advertising script and fill the sidebar, this will replace the content shown by default. Videos inserted as plain URL in WordPress 2.9 will get resized on the fly in archive pages and the latest video post in the sidebar. 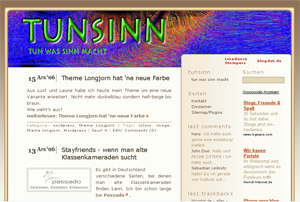 About this Theme: Barthami Red is using an image slider for the latest four posts of your blog. These latest posts are inserted automatically. The size of images in the slider and on most templates is managed by a thumbnail resizer script (timthumb). Original Images are taken from a customfield or by autoinsert the first image in the post. Gravatar and threaded comment support is included. Display settings in theme options let you set the categories to show in the category bar and exclude pages from the navigation. Use widgets to set your advertising script and fill the sidebar, this will replace the content shown by default. Hello! I want to say gracias for an interesting site about a something I have had an interest in for many years now. I have been lurking and reading the entries avidly and just wanted to thank you for providing me with some very good posts. I look forward to more, and taking a more active part in the conversations on this site.